Narasimha is one of the avatars of Lord Vishnu. The purpose of this man – lion incarnation of the god to kill the Hiranyakashipu. 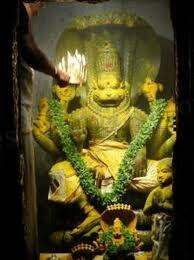 Narasimha Jayanti is the celebration of appearence (birth) of Lord Narasimha. Every year it is celebrated on chaturdashi day of the bright fortnight in the monnth of Vaishaka. This year, Narasimha Jayanti falls on Saturday, 26th May 2029. 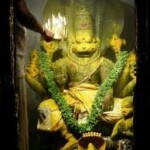 Devotees of lord Narasimha observe a fast and visit temples on Narasimha Jayanti day. Special prayers and rituals performed in God Vishnu temples. The rules of this fast is similar to ekadashi fast. This fast is broken on the next day, when Chaturdashi Tithi is over.